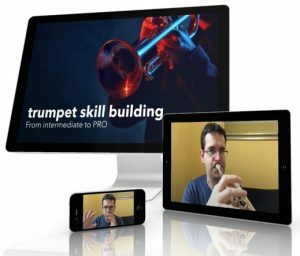 Many trumpet players are looking for the “missing link”, the secret or hidden trick for improving their trumpet playing. New knowledge sometimes results in “sudden” drastic improvement. This is observed now and again in master classes. In order for this sudden impetus to occur so that the next level can be reached, a great deal of preliminary work MUST be done. Nothing comes from nothing – therefore it is worthwhile to focus on fundamentals consistently. One of these fundamentals is the use of your fingers. These should always move as fast as possible. As Claude Gordon wrote: “Lift fingers high. Strike valves hard.” Why does this make sense? Because the air cannot flow freely during the moment of pressing. You can try this out sometime by moving the valves extremely slowly, or stopping them halfway. The trumpet appears “dense”. But the much bigger problem arising from slow pressing is the fact that the increased air resistance also makes the vocal folds “shut”. This way, you now have two areas in which air cannot flow freely. This is reason enough to make sure that you always press (and release) the valves quickly. Because a “smearing”, an undesirable “glissando”, occurs between the tones. In some musical styles this may occasionally be desirable (e.g. in jazz). Mostly, however, it simply unpleasant to hear and it’s better if you can turn on the “smearing” to a certain extent when you need to, and otherwise play clean! The finger technique is almost always underestimated, so during the next practice session it’s a good idea to concentrate on it and become accustomed to always pressing quickly in the future. How? Simply by being aware of it for a certain length of time during each practice.